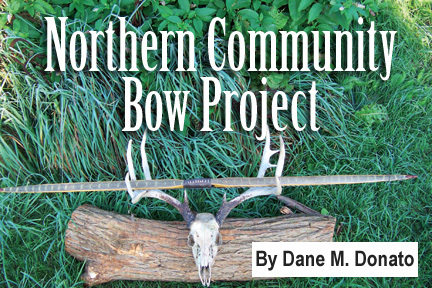 Matt Newcomb of Windham, Ohio, took on the challenging task of tillering the bow. 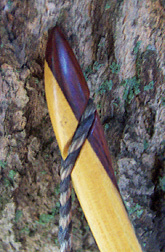 He was the youngest member of the Yankee bow building clan and turned in some excellent work. The bow came out to 66" tip to tip, and 1.25" at the fades. Next in line was Keenan Howard from Bend, Oregon. Keenan, who wore more than one craftsman’s hat for the project, offered the group the opportunity to decide on either buffalo horn or zebra wood tips. Although it was a difficult choice, zebra wood was selected. Sturgeon skins were then applied with traditional hide glue. Keenan posted photos of his work, showing clearly that the bow was continuing to become far more than the sum of its components, a deadly thing of great beauty and grace. The bow then headed north to Zane in Medical Lake, Washington. Zane performed the sanding on the bow and then dispatched the weapon to Gordon Ferlitsch, a bowyer who makes Oregon his home. Gordon is a highly competent bowyer, and he faced a difficult situation. As anyone who builds primitive bows can attest, one of the joys and frustrations of the craft is solving a range of technical challenges as a weapon emerges from raw materials. While checking the tiller, Gordon noticed that one limb was weaker than the other, and at this point, the bow came in at 42 pounds. Gordon decided to pike the bow and retiller. Unfortunately, Keenan’s beautiful tips were lost, but the bow, now at 61" nock to nock, pulled 47 pounds at 28" draw length. 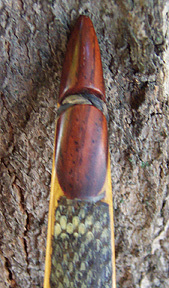 Gordon made new tip overlays out of coco bolo, a beautiful and very distinctive tropical hardwood, and then refinished the bow using Tru Oil. As well, Gordon crafted a reverse twist Flemish bowstring out of B-50 Dacron. And so, feeling pity on the boys south of the Mason-Dixon line, I agreed to create a sock for the Southern bow. Frankly, it was a splendid weapon they were creating, and I was honored to be asked to help, thus ‘crossing over the lines.’ The sock for the Southern bow was made from blue wool, while the Northern sock was green with yellow linen trim. In spite of a major house remodeling project, Jamie Leffler, a primitive artist of the highest caliber whose home is in Connecticut, set to work crafting an amazing set of arrows. 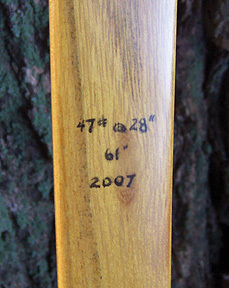 With shafts made from Sitka spruce, he footed the shafts and created knock inserts out of purpleheart. Hand-crested in white green, red, and black, Jamie fletched three arrows with red-dyed turkey feathers and three with natural turkey feathers, all cut in a shield shape. Jamie also contributed one of his beautiful leather back quivers to the project, made from egg tanned deer leather from an animal he had brought down with one of his own bows. Jamie then shipped the arrows and quiver to Keenan, who was not done contributing to the project. Among the many talents he marshaled for this project, Keenan volunteered his skills as a skilled flint knapper. He made up some razor-sharp arrowheads out of obsidian and attached them to three of Jamie’s shafts. The other arrows sported target tips. 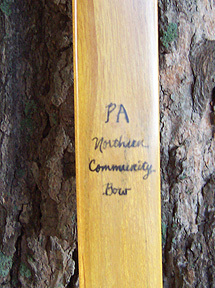 Ryan O’Sullivan of Waterford, Pennsylvania, the first volunteer ‘soldier,’ was the last contributor to the project, creating a very handsome handle wrap from beaver tail. 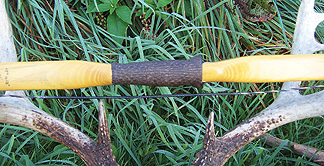 Although this is a challenging material to work with, he did a fantastic job with the same hallmark of superior craftsmanship he exhibits in the trademark recurve hunting bows in which he specializes. Ryan also crafted a double-sided arrow shelf, making the bow suitable for either a right or left handed archer. Finally, Ryan made two string silencers, and the project, five months later, was finished and ready for its new owner.